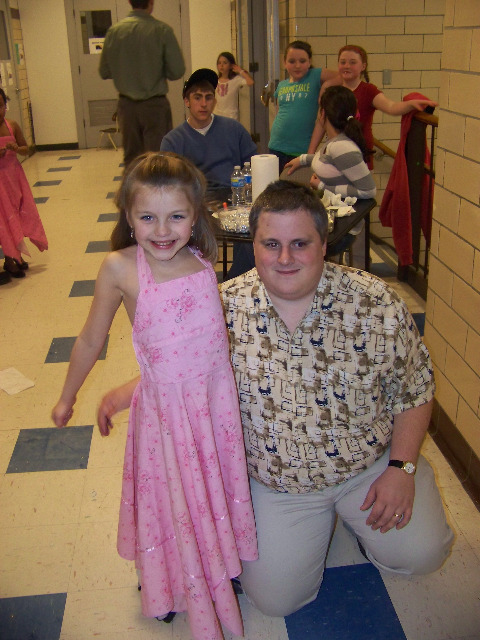 Yesterday, I attended a father daughter dance with Gabby. As you might imagine, Gabby has discussed nothing else for the past week and it was truly wonderful to see her so happy. I confess that I don’t like dances, not because I’m a terrible dancer (I’ve come to grips with my lack of dancing ability) but because the noise level makes me feel totally disoriented. I often use sound as a way to orient myself within a space and find that the loud music simply makes that impossible. Based on the echos in the room, I had the feeling at one point that we were dancing near a wall. When I reached out to find this wall, however, the only thing I found was another couple. oops. I suspect this really isn’t a blindness thing as plenty of other blind folks love dancing. STill, I’m curious what others think? Most of the kids at the dance were under ten years old. That, coupled with the fact that they were all dancing with their fathers, or presumably they were dancing with their fathers made me really question the DJ’s decision to play Lady Gaga’s “Love game.” For those unfamiliar with this particular song, the lyrics are, well, let’s just say more than slightly suggestive. For those curious, you can read the lyrics here, or can listen to the song here. What was he thinking? All in all, a great time was had by us both, she was incredibly happy and I was happy to get to spend time with her, something I fear will happen less and less as she gets older.